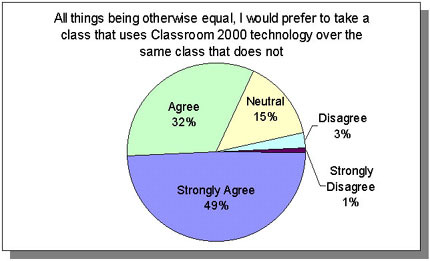 Classroom 2000 is an attempt to study the impact of ubiquitous computing on education. We have built a prototype classroom environment and the necessary software infrastructure to seamlessly capture much of the rich interaction that occurs in a typical university lecture. By capturing the different streams of activity in the classroom and presenting an easily accessible interface that integrates those streams together, we reduce the need for mundane note-taking, allowing the student to engage in and better understand the classroom discussion. Our ultimate goal is to revolutionize the classroom experience through the evolutionary introduction of a natural and useful capture, integration and access service. We empower professors by providing software tools for use with electronic whiteboards. Professors can fully use our tools with minimal effort and change to their current routine. Whiteboard activity is captured by using a Java applet, ZenPad. 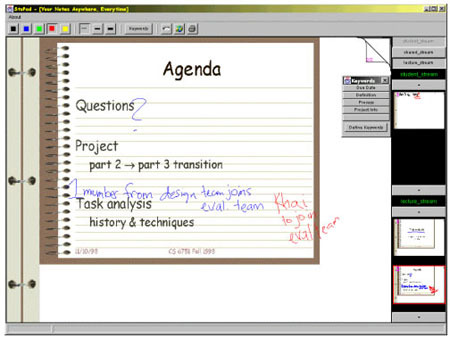 This program allows instructors to write on a blank electronic whiteboard or on top of prepared slides. The electronic annotations, audio, video, and even Web browser activity, are all automatically recorded and time-stamped. By capturing these events, we can later recreate the lecture experience. After a lecture, ZenPad automatically weaves the captured events together into a set of standard HTML Web pages. The interface includes a timeline that provides an index to the video, slides, and visited Web pages. 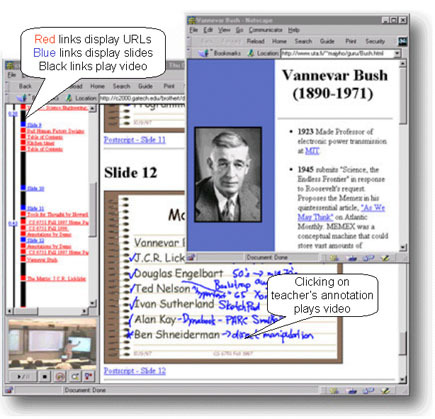 While viewing a slide, students can click on the teacher's annotations to replay the audio and video at the time the ink was written. Clicking on a visited URL opens a browser at that location. Students can also replay the entire lecture without any intervention. Classroom 2000 has been an ongoing research effort for over 3 years with over 100 classes taught by more than 24 instructors. As a part of our evaluation of the system we distribute a questionnaire at the end of each course taught. To date we have data from nearly 700 students ranging from undergraduate to graduate in courses from Math, Engineering, and Computer Science. Overall, we find that students typically depend on the notes provided, and while they don't feel like it's a substitute for attending class, they are relieved to have the system in place on the occasions when a class must be missed. Recording and organizing information is only half of the story. For effective use of the notes students need access to a variety of methods for finding the information they need. This involves being able to extract meaning from information recorded, and providing an interface for searching. Collaboration can be a crucial part to any educational experience. We have incorporated a collaborative discussion space, or CoWeb, developed by other Georgia Tech researchers. 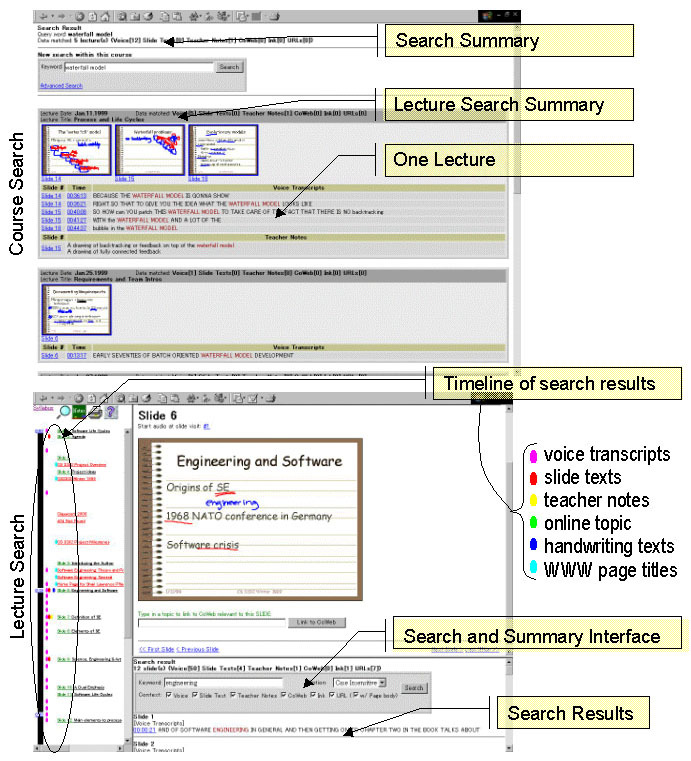 The advantage of combining CoWebs with Classroom 2000 is that discussions are now anchored to relevant parts of the lecture, and the lecture extends into other activities outside of the classroom experience. The best way to judge the impact of a ubiquitous computing system is through authentic use. 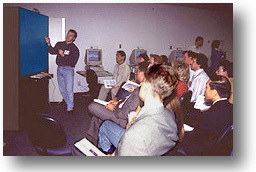 Since January 1997, many classes in the College of Computing have utilized Classroom 2000 and the ZenStar system. Other universities are now beginning to use the ZenStar system as well. By living our version of the future, we can provide the research and industrial communities a view into how ubiquitous computing technology and automated capture technology benefits our everyday lives. How much does the system really cost? What's the system like in action? Further information on the Classroom 2000 project, including contacts and recent publications, can be found at http://www.cc.gatech.edu/fce/c2000. Classroom 2000 is a project of the Future Computing Environments Group in the College of Computing and GVU Center at Georgia Tech. More information can be found at http://www.cc.gatech.edu/fce or by contacting Dr. Gregory D. Abowd or Jason A. Brotherton.